Fast facts about Vitamin E 200 I.U. Vitamin E is a fat-soluble vitamin composed of a group of compounds. The eight primary compounds that make up the vitamin E family break down into two (2) groups; tocopherols and tocotrienols, with each having an Alpha, Beta, Gamma and Delta component. Alpha tocopherol was the first to be discovered and label potency usually reflects only the amount of this fraction. Research is showing the others may have previously unknown importance, however. Natural vitamin E is a very expensive raw material, so the manufacture or use of synthetic versions has always been a money-making venture for many companies. As a result, there are many products on the market that are either 100% synthetic or blends of synthetic and natural materials. If a product is labelled correctly, it is actually quite easy to determine if it is natural or synthetic. 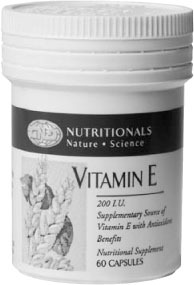 All natural vitamin E is labelled as d-alpha, as in d-alpha tocopherol. Synthetic vitamin E should be labelled as dl-alpha, as in dl-alpha tocopherol. Thus d signifies natural and dl signifies synthetic. Vitamin E acts primarily as an antioxidant in the body. It increases the cell’s ability to protect itself from undesirable reactions with oxygen. It protects unsaturated fatty acids and vitamin A against oxidation in the body. The average diet does not supply enough vitamin E to meet the established RDA, but deficiencies are not currently recognized. Although the vitamin appears to be associated with many functions in the body, no specific deficiency condition has yet been identified. Many researchers now feel that a long term marginal deficiency simply diminishes the body’s ability to protect itself from certain potentially dangerous compounds that either occur from metabolism or are present in our environment. *Consumers of vitamin E products most often raise questions as to price and quality. Consider this discussion to help your customer understand the vitamin E difference. The raw materials used in vitamin E products vary greatly in their degree of processing and ingredients used in the processing. The resulting vitamin E substance correspondingly will vary in its concentration level and the presence of other E tocopherols. Since the government recognises only the alpha tocopherol form of vitamin E, this is what is measured to identify the potency of the product (e.g. 200 I.U.). However, research indicates that the alpha tocopherol is not the only tocopherol valuable for optimal well-being. Rather, vitamin E could be better described as “E Complex” since several tocopherols provide benefits. For this reason, GNLD offers an “E Complex” product. *A second important concept in explaining price and quality is the difference between natural and synthetic forms of vitamin E. There is a definite difference between naturally occurring and synthetic forms of the alpha tocopherol. (Analysis shows the synthetic to be levo-rotary or a “left-handed” molecule while the natural is dextro-rotary or “right-handed”.) The naturally occurring is described as d-alpha tocopherol while the synthetic is dl-alpha tocopherol. This is extremely important, since the human body is as much as 5 times more efficient in utilizing the naturally occurring d-alpha tocopherol. Because this is such a technical and confusing issue, encourage your customer to experience the GNLD difference and to rely on GNLD’s commitment to product quality and excellence.